Before you access the Ecodan Selection Tool you must confirm that you have read and understood the terms and conditions and accept these terms and conditions as binding on you. The terms and conditions include a privacy section which governs our use of your personal data – please see the Privacy section (section 8) below. Access to the Ecodan Selection Tool is only authorised for users wishing to assess the potential for application of a Mitsubishi Electric Ecodan heat pump system for a property located within England, Wales and Scotland and any potential Renewable Heat Incentive (“RHI”) benefits for that system. You will be required to accept these terms and conditions (including the Privacy section) each time you seek to access the Ecodan Selection Tool. The terms and conditions may be varied from time to time without notice: it is important that you take time to review these terms and conditions each time you use the Ecodan Selection Tool. indicative potential RHI benefits for that system: any calculation or indication is only an estimation. This is made in reliance upon on your data inputs and taking account of the tariff level for renewable energy generated by air source heat pumps as indicated by the UK Department of Energy and Climate Change (“DECC”) and associated performance factors, RHI benefits are indicated subject always to the RHI scheme for domestic properties being opened by DECC. A full Energy Performance Certificate (“EPC”) assessment would be required for an accurate RHI valuation. Where you chose to provide lower-level data for your property then the Ecodan Selection Tool indicators will be also be lower level. We do not grant you any licence or consent to copy, alter or modify the Ecodan Selection Tool. You will not reverse engineer, decompile or dissemble the Ecodan Selection Tool or create any derivative works based on the Ecodan Selection Tool. You do not acquire any intellectual property rights and/or database rights in the Ecodan Selection Tool: all copyrights and other rights in the Ecodan Selection Tool are the property of Mitsubishi Electric. The Ecodan Selection Tool may contain embedded software programs which are copyright of third party suppliers to Mitsubishi Electric: you have no right to use those programs except as part of the Ecodan Selection Tool. You will use the Ecodan Selection Tool only in relation to a property which you own, rent or occupy. Mitsubishi Electric Accredited Ecodan Installers may also use the Ecodan Selection Tool in support of any site-specific assessment. You must not introduce any virus or other software to the Ecodan Selection Tool or otherwise harm the Ecodan Selection Tool. You must apply and maintain appropriate anti-virus software and firewalls on your equipment used to access the Ecodan Selection Tool and to receive any data output from Mitsubishi Electric. We have endeavoured to avoid any software virus being embodied within the Ecodan Selection Tool. However, We shall not be liable for any data corruption or systems damage arising from any software virus affecting the Ecodan Selection Tool where you view Ecodan Selection Tool screens on your own PC or other equipment and/or create any report populated with Ecodan Selection Tool data. You will be responsible for the payment of all charges from your internet service provider or mobile device carrier incurred for Your access to and use of the Ecodan Selection Tool, including any charges for Your viewing of data from Mitsubishi Electric. You acknowledge that We have no responsibility for such charges. We are not responsible for the proper functioning of your access device, router and internet service provision. We retain exclusive ownership of all Ecodan Selection Tool content and any data generated by your accessing the Ecodan Selection Tool. You will not be able to store data in the Ecodan Selection Tool or recover any data previously entered by you into the Ecodan Selection Tool. We reserve the right without prior notice to modify the Ecodan Selection Tool or suspend access to or withdraw the Ecodan Selection Tool in the event that any person alleges that the Ecodan Selection Tool infringes a third party’s intellectual property rights or we have reason to believe that the Ecodan Selection Tool infringes a third party’s rights. User instructions, efficiency and performance notices, webpages and notices set out in the Ecodan Selection Tool shall form part of these terms and conditions to the extent they set mandatory user requirements or explain how We compute indicative operational costs and any cost comparisons. You undertake to hold harmless and indemnify Mitsubishi Electric against any actual or threatened claim alleging loss, damage, liability or expense arising out of or in connection with your use or application of the Ecodan Selection Tool and any data generated from the Ecodan Selection Tool. Ecodan Selection Tool indicators and assumptions including energy cost assumptions will vary from time to time but with no prior notice to Ecodan Selection Tool users. Potential cost-savings and any benefits are not warranted. Cost-saving computations are merely indicative: We apply your answers against estimated potential savings compared to other types of heating systems. The markets for gas, oil and electricity are subject to significant price movements and pricing variations between energy suppliers. We cannot compute any actual cost saving or cost increase applicable to your property based on your data entry. We cannot compute any actual cost saving relative to any commercial user discounts or group user discounts which you may negotiate with energy suppliers or which you may be eligible to claim. For comparative energy costs, We use data published by DECC. This comparative cost data is historic and is liable to be updated by DECC without notice. We shall endeavour to publish a link to the then current DECC data on our website for the Tool. We will update the Ecodan Selection Tool to take account of any updating by DECC of its comparative cost data as soon as practicable. We are not responsible for any aging, errors or omission in DECC’s data. Energy cost data shown is based upon the indicative costs per kWh of energy, Ecodan energy cost data being based upon the indicative cost of electricity. Actual energy costs are a market variable. Any RHI benefits are indicative and estimates only: see Clause 2.a.iv above. Any data accessed by you from the Ecodan Selection Tool, any contact requests made by you to Mitsubishi Electric and any proposal document forwarded to you by Mitsubishi Electric based on your inputs to the Ecodan Selection Tool does not represent an offer by Mitsubishi Electric to sell you or provide you with any goods or services. The Ecodan Selection Tool is not designed to give site-specific data for your property. The Ecodan Selection Tool cannot take into account all factors specifically affecting energy consumption for the supply of heating and hot water to your property. You must not rely on the Ecodan Selection Tool data for any final determination of your heating and hot water requirements or final design or specification of a Mitsubishi Electric Ecodan heat pump system.You must not rely on the Ecodan Selection Tool or any proposal document forwarded to you by Mitsubishi Electric for any assurance as to RHI qualification or RHI benefits. You are strongly recommended to consult a Mitsubishi Electric Accredited Ecodan Installer for a site survey: this will include assessment of any insulation works as may be required for your property and any other improvements such as pipework and radiator upgrades necessary for the efficient operation of a Mitsubishi Electric Ecodan System. We apply estimated efficiencies comparing Mitsubishi Electric Ecodan heat pump units against gas or oil-fired boilers. Many factors affect the performance of an Ecodan air source heat pump; and in turn the data displayed on this website. This website should only be used as a guide to indicate how well an Ecodan air source heat pump can perform IF the system incorporating that heat pump is designed, installed, commissioned and operated correctly. Installation of an Ecodan air source heat pump as part of your property’s heating system may not achieve this optimal level of performance. Performance will be affected by the level of insulation at your property and your property’s build type. Performance will be affected by system design including appropriate design selection of heating system components such as the hot water cylinder, thermal efficiency of radiators/pipework, the external physical location of the Ecodan heat pump and operational settings i.e. how you use the heating system. Where We refer to “COP” this means the “co-efficient of performance” or efficiency of the Ecodan heat pump. This is a measure of efficiency of the heat pump unit alone i.e. the outdoor part of the Ecodan heating system. It does not take into account the whole system incorporating that heat pump. Additional components will include ancillary pumps and hot water cylinder immersion heater. The whole system efficiency will be lower than a stated COP figure for the Ecodan heat pump unit itself. We do not warrant that the Ecodan Selection Tool is error-free. We shall endeavour to correct any error as this may become known: this shall not affect the exclusions and limitations of liability set out in the Terms and Conditions. We shall not be obliged to continue error correction where (i) We consider that the error is not material; or (ii) that error correction is not economic and/or shall be held over to a new release of the Ecodan Selection Tool at a future date. We do not warrant that that access to the Ecodan Selection Tool will be available at all times or available without interruption. The Ecodan Selection Tool is not specifically developed and is not authorised for use in designing any system requiring any real-time fail-safe performance environment and particularly any application-critical heating or hot water supply. You agree that you shall not attempt to hold Mitsubishi Electric or any third party supplier to Mitsubishi Electric liable for any claims or damages arising from any improper or unauthorised use towards application-critical heating or hot water supply: if, in breach of this obligation, you do so use the Ecodan Selection Tool then you agree to hold harmless and indemnify MEU-UK and its third party suppliers from and against all claims for loss, liability, damage or expense arising out of or in connection with such use. Any claims on your part, in particular any claim for damages due to failure of the Ecodan Selection Tool or for any damage loss or expense resulting from any error or defect in the Ecodan Selection Tool, are excluded by Mitsubishi Electric to the maximum extent permissible by law. This limitation shall also apply for the benefit of any third party suppliers to Mitsubishi Electric. any other liability that cannot be excluded by law. Other economic loss including: (a) loss or failure to achieve any anticipated savings, (b) failure to achieve the sale or disposal of your home; (c) loss of data; (d) any other special or indirect loss; (e) costs of alternative heating and/or hot water supply; (f) wasted time and expenditure; (g) any other loss, cost, damage or expense; related to your usage of the Ecodan Selection Tool or your inability to access the Ecodan Selection Tool at any time. where the efficiency and/or performance of an installed Ecodan heating system fails to meet any indicative data generated by your use of the Ecodan Selection Tool. Subject to sub-sections a., b., c. and d. above, We limit our liability to you for any loss or damage to your property arising in connection with your access to and use of the Ecodan Selection Tool to a maximum of £2,000 for any one event or series of connected events. You will provide us your personal data when you enter data in to the Website and/or press “SEND”, “AGREE” or “CONFIRM”. You may also provide us personal information through correspondence and support calls where you request that you be contacted for a site specific assessment or quotation by an independent Accredited Ecodan Installer. We may share your personal information with other Mitsubishi group companies and agents and contractors for the purposes set out above. Those entities may use the personal information for those purposes. We will continue to hold and use the information you have provided in accordance with section 8.b generally in accordance with Mitsubishi Electric’s personal data retention policies save that details of any indicative guidance issued to you (and your corresponding data submission) for the Ecodan Selection Tool will be maintained to the extent We reasonably determine necessary in order that We can to respond effectively to any claim against Mitsubishi Electric. that you are in breach of these Terms and Conditions of Use. Any right of access is not assignable or transferable by you. No other person can enforce your rights under these Terms and Conditions. Except for any third party suppliers to Mitsubishi Electric who rank as third party beneficiaries to your obligations set out in these terms and Conditions of Use, all third party rights under The Contracts (Rights of Third Parties) Act 1999 are excluded. Subject only to Mitsubishi Electric’s User instructions, efficiency and performance notices, notes and notices set out in the Ecodan Selection Tool webpages, these Terms and Conditions of Use represents the entire agreement and understanding concerning your access and operation of the Ecodan Selection Tool and supersede any prior agreement or arrangements in respect of the subject matter. Any notice required to be sent to you may be delivered by hand or first class pre-paid letter and shall be deemed to have been served if by hand then delivered and if by first class post 48 hours after posting. Any illegality, invalidity or unenforceability of any section or sub-section and/or provision of these Terms and Conditions of Use shall not affect the legality, validity or enforceability of the remainder. Any delay or failure by Mitsubishi Electric to insist that you perform your obligations does not rank as a waiver of Mitsubishi Electric’s rights. These Terms and Conditions of Use shall be governed by and construed in accordance with English law and you submit to the non-exclusive jurisdiction of the English Courts. trading from Travellers Lane, Hatfield, Herts., AL10 8XB. 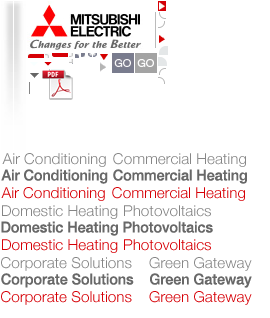 Copyright © 2014 Mitsubishi Electric Corporation. All Rights Reserved.